The backstage area was packed with excitement for three big shows on Day Two of Toronto Fashion Week Reimagined. First up was Narces with a dramatic hair and makeup look to set the tone for the day. MAC senior artist Melissa Gibson created a 1920’s-style look that consisted of blocked out eyebrows, a smoky eye and black lipstick. “It was an homage to Marlene Dietrich,” says Gibson. “We blocked out models’ eyebrows and then drew a version of Dietrich’s iconic arches above their natural brows.” Models’ pouts were then painted with Black Lip Mix drawing in a pointed, exaggerated cupid’s bow for a dramatic lip look. For hair, senior stylist at Victoria Radford Saira Remtulla created a modern faux bob on all the girls. “We went for a 1920’s look,” says Remtulla. 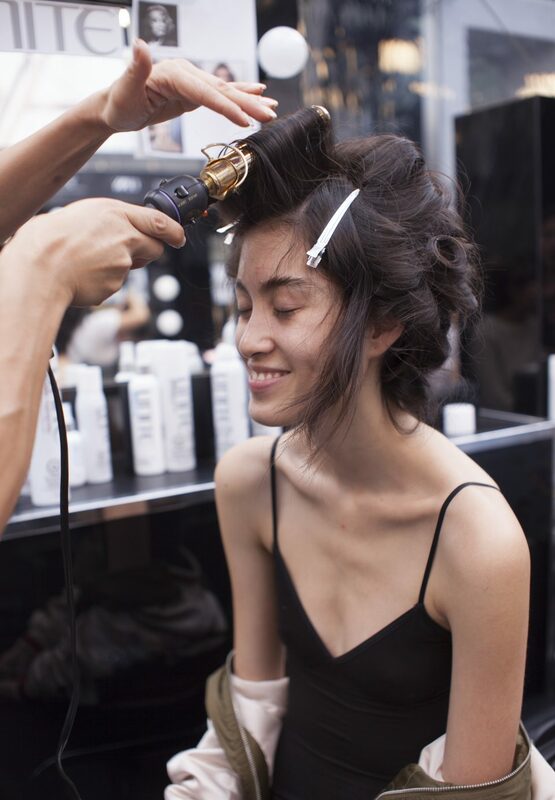 “The designer wanted all the models to be unified with a waved-out bob.” To keep this style in place, Flow impeccableFINISH FAST DRY Hairspray was the key product being spritzed backstage. “We used a light hairspray first and then finished the look with an extreme hold spray,” says Remtulla. Next to hit the runway was Bustle. With a handful of men, women and children walking in the show, MAC senior artist Jane McKay was tasked with making the women look fresh, beachy and sun-kissed. “I created light reflective skin using Strobe Cream in Lite Gold then highlighted around models’ eyes using Extra Dimension Skinfinish in Double Gleam in a ‘c’ shape around the eye,” says McKay. She then used Tan Pigment all over the lid for a warm, golden eye and smudged a cream and a pencil liner into upper and lower lash lines. She finished off with a few coats of black mascara for a natural, sultry eye. The final show of the day was UNTTLD, and the beauty look was clean and simple with a focus on heavy lashes. Gibson described the models as “hard edge dollies,” with four different types of false lashes being used to create the dramatic, wide-eyed looks. “The designers didn’t want the girls looking too sweet and innocent, they wanted them to look a little more stern,” says Gibson. As for the hair, Remtulla was given specific guidance for the look: “The designers want it to look like the models don’t have hair.” She created that illusion by making manes super glossy using a wet mousse and then layering a shine spray over top to seal the look in. The finished result was a middle-parted low ballerina bun that was super tight to the head.